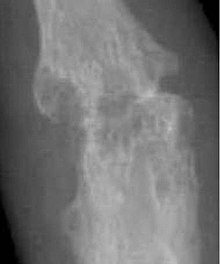 Bone erosions by rheumatoid arthritis. Individuals with arthritis can benefit from both physical and occupational therapy. In arthritis the joints become stiff and the range of movement can be limited. Physical therapy has been shown to significantly improve function, decrease pain, and delay need for surgical intervention in advanced cases. Exercise prescribed by a physical therapist has been shown to be more effective than medications in treating osteoarthritis of the knee. Exercise often focuses on improving muscle strength, endurance and flexibility. In some cases, exercises may be designed to train balance. Occupational therapy can provide assistance with activities. Assistive technology is a tool used to aid a person's disability by reducing their physical barriers by improving the use of their damaged body part, typically after an amputation. Assistive technology devices can be customized to the patient or bought commercially. People with hand arthritis can have trouble with simple activities of daily living tasks (ADLs), such as turning a key in a lock or opening jars, as these activities can be cumbersome and painful. There are adaptive aids or (assistive devices (ADs)) available to help with these tasks, but they are generally more costly than conventional products with the same function. It is now possible to 3-D print adaptive aids, which have been released as open source hardware to reduce patient costs. Adaptive aids can significantly help arthritis patients and the vast majority of those with arthritis need and use them. Arthritis is predominantly a disease of the elderly, but children can also be affected by the disease. Arthritis is more common in women than men at all ages and affects all races, ethnic groups and cultures. In the United States a CDC survey based on data from 2007–2009 showed 22.2% (49.9 million) of adults aged ≥18 years had self-reported doctor-diagnosed arthritis, and 9.4% (21.1 million or 42.4% of those with arthritis) had arthritis-attributable activity limitation (AAAL). With an aging population, this number is expected to increase. ^ "arthritis noun - Definition, pictures, pronunciation and usage notes Oxford Advanced Learner's Dictionary". www.oxfordlearnersdictionaries.com. Retrieved 14 December 2017. ^ a b c d e "Arthritis and Rheumatic Diseases". NIAMS. October 2014. Archived from the original on 4 October 2016. Retrieved 14 September 2016. ^ a b "Arthritis Types". CDC. June 22, 2016. Archived from the original on 14 September 2016. Retrieved 14 September 2016. ^ a b Athanasiou, Kyriacos A.; Darling, Eric M.; Hu, Jerry C.; DuRaine, Grayson D.; Reddi, A. Hari (2013). Articular Cartilage. CRC Press. p. 105. ISBN 9781439853252. Archived from the original on 2016-12-20. ^ a b c "Arthritis Basics". CDC. May 9, 2016. Archived from the original on 17 September 2016. Retrieved 14 September 2016. ^ a b c d e f g h i j "Living With Arthritis: Health Information Basics for You and Your Family". NIAMS. July 2014. Archived from the original on 4 October 2016. Retrieved 14 September 2016. ^ a b c "Arthritis: An Overview". OrthoInfo. October 2007. Archived from the original on 19 September 2016. Retrieved 14 September 2016. ^ a b c "Arthritis". CDC. July 22, 2015. Archived from the original on 22 September 2016. Retrieved 14 September 2016. ^ March, L; Smith, EU; Hoy, DG; Cross, MJ; Sanchez-Riera, L; Blyth, F; Buchbinder, R; Vos, T; Woolf, AD (June 2014). "Burden of disability due to musculoskeletal (MSK) disorders". Best Practice & Research. Clinical Rheumatology. 28 (3): 353–66. doi:10.1016/j.berh.2014.08.002. PMID 25481420. ^ Richette P, Bardin T (January 2010). "Gout". Lancet. 375 (9711): 318–28. doi:10.1016/S0140-6736(09)60883-7. PMID 19692116. ^ "National Health Survey". ABS. 8 December 2015. Archived from the original on 16 January 2017. Retrieved 14 January 2017. ^ Pirotta, M (September 2010). "Arthritis disease - the use of complementary therapies". Australian Family Physician. 39 (9): 638–40. PMID 20877766. ^ Waite, Maurice, ed. (2012). Paperback Oxford English Dictionary. OUP Oxford. p. 35. ISBN 9780199640942. Archived from the original on 2016-12-20. ^ Leonard, Peggy C. (2015). Quick & Easy Medical Terminology - E-Book. Elsevier Health Sciences. p. 160. ISBN 9780323370646. ^ Guandalini S, Assiri A (Mar 2014). "Celiac disease: a review". JAMA Pediatr. 168 (3): :272–8. doi:10.1001/jamapediatrics.2013.3858. PMID 24395055. ^ Fasano A, Sapone A, Zevallos V, Schuppan D (May 2015). "Nonceliac gluten sensitivity". Gastroenterology. 148 (6): 1195–204. doi:10.1053/j.gastro.2014.12.049. PMID 25583468. ^ Catassi C, Bai J, Bonaz B, Bouma G, Calabrò A, Carroccio A, Castillejo G, Ciacci C, Cristofori F, Dolinsek J, Francavilla R, Elli L, Green P, Holtmeier W, Koehler P, Koletzko S, Meinhold C, Sanders D, Schumann M, Schuppan D, Ullrich R, Vécsei A, Volta U, Zevallos V, Sapone A, Fasano A (2013). "Non-celiac gluten sensitivity: the new frontier of gluten related disorders". Nutrients (Review). 5 (10): 3839–3853. doi:10.3390/nu5103839. ISSN 2072-6643. PMC 3820047. PMID 24077239. ^ Wollenhaupt J, Zeidler H (1998). "Undifferentiated arthritis and reactive arthritis". Current Opinion in Rheumatology. 10 (4): 306–313. doi:10.1097/00002281-199807000-00005. PMID 9725091. ^ Swash, M, Glynn, M. (eds). 2007. Hutchison's Clinical Methods. Edinburgh. Saunders Elsevier. ^ "Direct and Indirect Costs of Musculoskeletal Conditions in 1997: Total and Incremental Estimates Revised Final Report (July, 2003)". Retrieved 6 April 2016. ^ "Rheumatoid Arthritis and Heart Disease Risk: Atherosclerosis, Heart Attacks, and More". Archived from the original on 2015-03-27. Retrieved 2015-06-09. ^ "Coping With Depression and Rheumatoid Arthritis". Archived from the original on 2015-05-14. Retrieved 2015-06-09. ^ "How is arthritis diagnosed? | Arthritis Research UK". www.arthritisresearchuk.org. Archived from the original on 2015-04-02. Retrieved 2015-06-09. ^ VanItallie TB (October 2010). "Gout: epitome of painful arthritis". Metab. Clin. Exp. 59 (Suppl 1): S32–6. doi:10.1016/j.metabol.2010.07.009. PMID 20837191. ^ Zhang Y, Jordan J (2010). "Epidemiology of Osteoarthritis". Clin Geriatr Med. 26 (3): 355–69. doi:10.1016/j.cger.2010.03.001. PMC 2920533. PMID 20699159. ^ Medications used to manage rheumatoid arthritis Archived 2015-11-17 at the Wayback Machine, Australian Institute Of Health And Welfare. Retrieved 2015-11-14. ^ Kurebayashi Y, Nagai S, Ikejiri A, Koyasu S (2013). "Recent advances in understanding the molecular mechanisms of the development and function of Th17 cells". Genes Cells. 18 (4): 247–65. doi:10.1111/gtc.12039. PMC 3657121. PMID 23383714. ^ a b Chabaud M, Garnero P, Dayer JM, Guerne PA, Fossiez F, Miossec P (2000). "Contribution of interleukin 17 to synovium matrix destruction in rheumatoid arthritis". Cytokine. 12 (7): 1092–9. doi:10.1006/cyto.2000.0681. PMID 10880256. ^ Won HY, Lee JA, Park ZS, Song JS, Kim HY, Jang SM, Yoo SE, Rhee Y, Hwang ES, Bae MA (2011). "Prominent bone loss mediated by RANKL and IL-17 produced by CD4+ T cells in TallyHo/JngJ mice". PLoS ONE. 6 (3): e18168. Bibcode:2011PLoSO...618168W. doi:10.1371/journal.pone.0018168. PMC 3064589. PMID 21464945. ^ Becker, Michael A. (2005). Arthritis and Allied Conditions: A textbook of Rheumatology edition 15. Lippincott Williams & Wilkins. pp. 2303–2339. ^ Ali S, Lally EV (November 2009). "Treatment failure gout". Medicine and Health, Rhode Island. 92 (11): 369–71. CiteSeerX 10.1.1.608.3812. PMID 19999896. ^ Unless otherwise specified in table box, the reference is: Agabegi, Elizabeth D.; Agabegi, Steven S. (2008). "Table 6–7". Step-Up to Medicine. Step-Up Series. Hagerstwon MD: Lippincott Williams & Wilkins. p. 253. ISBN 978-0-7817-7153-5. ^ Diagnosis lag time of median 4 weeks, and median diagnosis lag time of 18 weeks, taken from: Chan KW, Felson DT, Yood RA, Walker AM (1994). "The lag time between onset of symptoms and diagnosis of rheumatoid arthritis". Arthritis and Rheumatism. 37 (6): 814–820. doi:10.1002/art.1780370606. PMID 8003053. ^ Schaider, Jeffrey; Wolfson, Allan B.; Gregory W Hendey; Louis Ling; Carlo L Rosen (2009). Harwood-Nuss' Clinical Practice of Emergency Medicine (Clinical Practice of Emergency Medicine (Harwood-Nuss)). Hagerstwon, MD: Lippincott Williams & Wilkins. pp. 740 (upper right of page). ISBN 978-0-7817-8943-1. Archived from the original on 2015-03-21. ^ Ettinger WH, Burns R, Messier SP, Applegate W, Rejeski WJ, Morgan T, Shumaker S, Berry MJ, O'Toole M, Monu J, Craven T (1997). "A randomized trial comparing aerobic exercise and resistance exercise with a health education program in older adults with knee osteoarthritis. The Fitness Arthritis and Seniors Trial (FAST)". JAMA: The Journal of the American Medical Association. 277 (1): 25–31. doi:10.1001/jama.1997.03540250033028. PMID 8980206. ^ Fransen M, Crosbie J, Edmonds J (January 2001). "Physical therapy is effective for patients with osteoarthritis of the knee: a randomized controlled clinical trial (2001)". J. Rheumatol. 28 (1): 156–64. PMID 11196518. ^ "The Role of Occupational Therapy in Providing Assistive Technology Devices and Services". www.aota.org. 2018. Retrieved 2018-04-08. ^ "Arthritis Drugs". arthritistoday.org. Archived from the original on 22 July 2010. Retrieved July 5, 2010. ^ Reid MC, Shengelia R, Parker SJ (Mar 2012). "Pharmacologic management of osteoarthritis-related pain in older adults". The American Journal of Nursing. 112 (3 Suppl 1): S38–43. doi:10.1097/01.NAJ.0000412650.02926.e3. PMC 3733545. PMID 22373746. ^ Kirkley A, Birmingham TB, Litchfield RB, Giffin JR, Willits KR, Wong CJ, Feagan BG, Donner A, Griffin SH, D'Ascanio LM, Pope JE, Fowler PJ (2008). "A randomized trial of arthroscopic surgery for osteoarthritis of the knee". N. Engl. J. Med. 359 (11): 1097–107. doi:10.1056/NEJMoa0708333. PMID 18784099. ^ "10 Terrific Arthritis Gadgets - Arthritis Center - Everyday Health". EverydayHealth.com. Retrieved 2019-03-08. ^ "3-D Printing Offers Helping Hand to People with Arthritis". OrthoFeed. 2018-12-15. Retrieved 2019-03-08. ^ Pearce, Joshua M.; Bow, Jennifer K.; Gallup, Nicole (December 2018). "Economic Potential for Distributed Manufacturing of Adaptive Aids for Arthritis Patients in the U.S." Geriatrics. 3 (4): 89. doi:10.3390/geriatrics3040089. ^ Chen, Chiung-Ling; Lou, Shu-Zon; Chen, Fen-Fen; Teng, Ya-Ling; Lin, Chung-Hui; Yeung, Kwok-Tak (2016-03-29). "Use of and Self-Perceived Need for Assistive Devices in Individuals with Disabilities in Taiwan". PLOS ONE. 11 (3): e0152707. doi:10.1371/journal.pone.0152707. ISSN 1932-6203. PMC 4811424. PMID 27023276. ^ Rutjes, Anne Ws; Nüesch, Eveline; Sterchi, Rebekka; Kalichman, Leonid; Hendriks, Erik; Osiri, Manathip; Brosseau, Lucie; Reichenbach, Stephan; Jüni, Peter (2009-10-07). "Transcutaneous electrostimulation for osteoarthritis of the knee" (PDF). The Cochrane Database of Systematic Reviews (4): CD002823. doi:10.1002/14651858.CD002823.pub2. ISSN 1469-493X. PMID 19821296. ^ Brosseau L, Welch V, Wells G, Tugwell P, de Bie R, Gam A, Harman K, Shea B, Morin M (2000). "Low level laser therapy for osteoarthritis and rheumatoid arthritis: a meta-analysis". The Journal of Rheumatology. 27 (8): 1961–1969. PMID 10955339. ^ Brosseau, L; Robinson, V; Wells, G; Debie, R; Gam, A; Harman, K; Morin, M; Shea, B; Tugwell, P (19 October 2005). "Low level laser therapy (Classes I, II and III) for treating rheumatoid arthritis". The Cochrane Database of Systematic Reviews (4): CD002049. doi:10.1002/14651858.CD002049.pub2. PMID 16235295. ^ Vavken, P; Arrich, F; Schuhfried, O; Dorotka, R (May 2009). "Effectiveness of pulsed electromagnetic field therapy in the management of osteoarthritis of the knee: a meta-analysis of randomized controlled trials". Journal of Rehabilitation Medicine. 41 (6): 406–11. doi:10.2340/16501977-0374. PMID 19479151. ^ Walsh (7 October 2010). "One in Five Adults Has Arthritis". MedPage Today. Archived from the original on 10 October 2010. ^ GBD 2010 Country, Collaboration (23 March 2013). "GBD 2010 country results: a global public good". Lancet. 381 (9871): 965–70. doi:10.1016/S0140-6736(13)60283-4. PMID 23668561. ^ Usenbo, Anthony; Kramer, Veronika; Young, Taryn; Musekiwa, Alfred; Nurmohamed, Michael (4 August 2015). "Prevalence of Arthritis in Africa: A Systematic Review and Meta-Analysis". PLoS ONE. 10 (8): e0133858. Bibcode:2015PLoSO..1033858U. doi:10.1371/journal.pone.0133858. PMC 4524637. PMID 26241756. ^ Joel A. DeLisa; Bruce M. Gans; Nicholas E. Walsh (2005). Physical Medicine and Rehabilitation: Principles and Practice. Lippincott Williams & Wilkins. pp. 765–. ISBN 978-0-7817-4130-9. Archived from the original on 2017-01-08. ^ Blumberg BS, Sokoloff L (1961). "Coalescence of caudal vertebrae in the giant dinosaur Diplodocus". Arthritis Rheum. 4 (6): 592–601. doi:10.1002/art.1780040605. PMID 13870231. ^ Bridges PS (1992). "Prehistoric Arthritis in the Americas". Annual Review of Anthropology. 21: 67–91. doi:10.1146/annurev.an.21.100192.000435.